I’ve made this bread so often now I think I could make it in my sleep. It is really dependable, reasonably fast to make and good to eat. I always use fresh yeast if I can get it. No idea why, I just like it better and it’s how I learnt to bake bread many years ago now. I’ve not tried this recipe in a bread maker, mine retired to the garage when I finally got an AGA, and it’s not seen the light of day since. It is possible to make this every day and I certainly have, though because I’m cutting back on wheat at the moment I’m not baking it quite so often. This recipe is my standard go to especially if I’m in a hurry, it’s very forgiving and you can use whatever flour you have to hand, I’ve even used a mixture of left over bits of flour. All you have to do is adjust the amount of water slightly. Wholemeal flour generally needs a drop more than white flour. The amounts quoted will make a loaf like the one above or about a dozen bread buns as shown below. Put the flour into your mixing bowl or mixer, add the yeast, the salt, the honey and the olive oil. If like me, you are using a stand mixer, turn the mixer to a low speed (Kitchen Aid 2) – you don’t want to go any faster than this as the mixer won’t be able to cope. Otherwise mix the ingredients in your bowl with a spoon. As the ingredients are mixed together slowly add the warm water until the consistency is right. You want to achieve a firm dough that seems elastic with a smooth consistency which is neither too dry nor too moist. At this point, either leave the mixer to knead your dough for 8 to 10 minutes or knead it yourself after turning it out on a floured board. Before I got my Kitchen Aid I used a marble slab for this as its nice and cool for the dough and easy to clean afterwards. Once you’ve kneaded your bread, it needs to go into a large oiled bowl. I tend to oil the Kitchen Aid mixing bowl and return the dough to it unless I’m planning on using the mixer again straight away – it saves washing up! Cover the bowl with a clean tea towel or some cling film and put in a warm place to rise. The tea towel is the greener option. I like to put mine on the warm plate of the AGA as it rises the bread really quickly. How long this will take really depends on how warm it is. On the AGA it can take as little as 30-40 minutes. Grease your tin at this point. 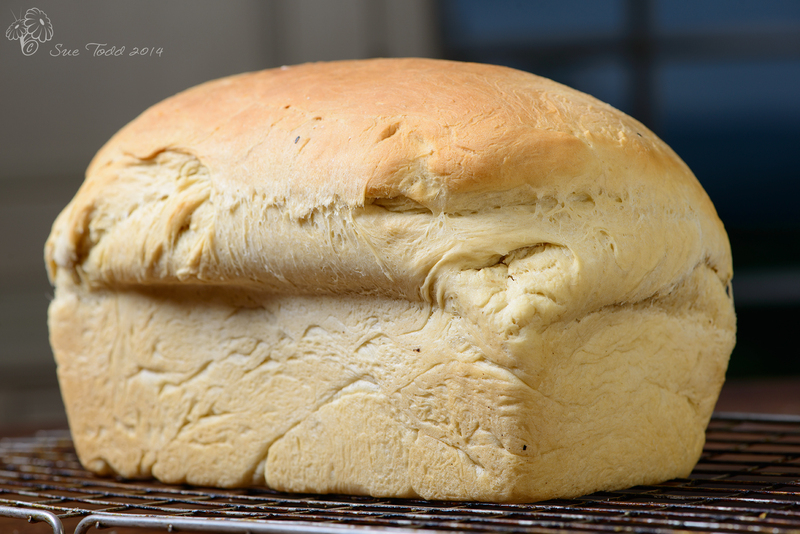 You can use a proper loaf tin, a flat tin and make a large round loaf or a large flat tin and produce bread buns. It’s useful to get this ready before the next stage though. Once your dough has doubled in size it’s time to knock it back. Again just a floured board and some gentle kneading. Then shape it how you want it, ready for a loaf tin, into one large flattish loaf, a cob, buns whatever. Pop the dough into the prepared tin and leave to rise again covering it with your towel again. Once the dough has risen generally doubling in size again, its time to put it in the oven to bake. I use the baking oven in the AGA and it takes about 20 minutes. If I’m making bread buns I check them after 15 minutes and then again at short intervals until done. When done the bread should tip out cleanly and if you tap on the base it should sound hollow. 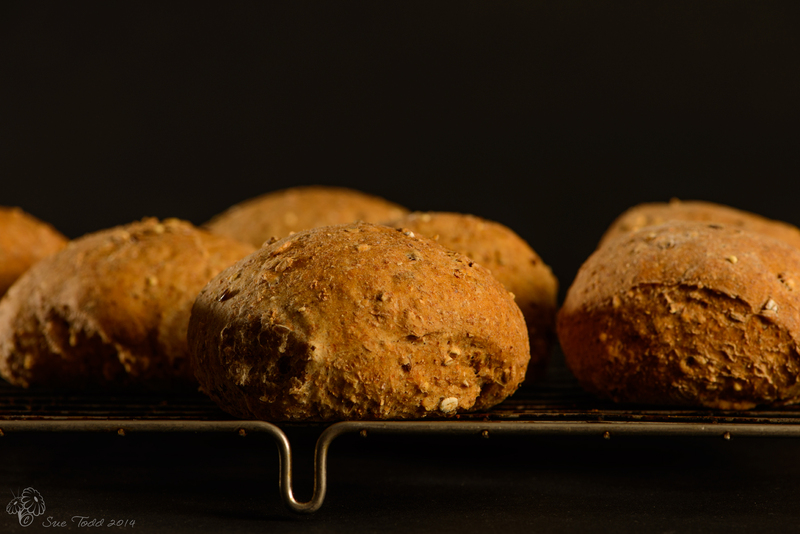 Put the bread to cool on a cooling rack and leave to cool before eating, though that is tricky, certainly in our house! There’s little nicer than a big stew, some soup or even just cheese with a fresh loaf of bread and a glass of wine. This entry was posted in Breads, Recipes on September 19, 2014 by Sue Todd. I'm a food photographer with a passion for all things foodie.